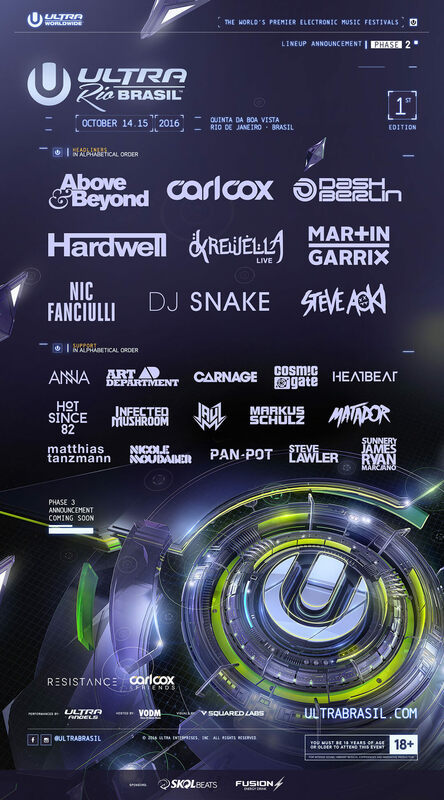 ULTRA Brasil has unveiled its Phase Two lineup, adding Above & Beyond, Krewella (Live), Nic Fanciulli and Steve Aoki to an already stacked list of headliners including international superstars Carl Cox, Dash Berlin, Hardwell, Martin Garrix and DJ Snake, for its first edition this October 14-15. Having announced its initial RESISTANCE lineup recently, ULTRA Brasil has upped the ante with their techno-driven stage by adding the following talent: Art Department, Mathias Tanzmann, Nic Fanciulli, Nicole Moudaber, Pan-Pot and Steve Lawler. Rounding off Phase Two, further international support comes in the form of Carnage, Cosmic Gate, Infected Mushroom, Markus Schulz and Sunnery James & Ryan Marciano marking this debut event as a true celebration of all electronic music genres. Set to take place at the spectacular Quinta da Boa Vista Park, all eyes are set on Rio de Janeiro and ULTRA Brasil, as the country prepares to host another world- renowned event in its capital city. ULTRA Brasil will mark the final stop of what has been a historic calendar year for the ULTRA Worldwide brand, which will have hosted a total of 21 shows on five continents by the close of 2016. With select tickets available at R$ 836.00, fans are advised to act quickly to grab the remaining few. Get yours here. Keep up with all the latest developments at ultrabrasil.com and for local details, stay tuned to ULTRA Brasil’s social feeds. To follow all other ULTRA Worldwide events, visit umfworldwide.com. The internationally renowned festival, which has taken place every March since its inception, celebrated its eighteenth anniversary on March 18-20, 2016 by bringing over 165,000 music enthusiasts to the sold out waterfront event in the heart of the City of Miami. Ultra Music Festival®, recently voted the world’s #1 Festival by DJ Mag, returns to Bayfront Park for its nineteenth annual edition on March 24-26, 2017. Over the past eighteen years, thousands of the world’s most iconic DJs, producers and live acts have mesmerized audiences with awe-inspiring sets at ULTRA festivals in ARGENTINA, BALI, BRAZIL, CHILE, CROATIA, IBIZA, JAPAN, KOREA, SOUTH AFRICA and of course MIAMI, as well as ROAD TO ULTRA® events in BOLIVIA, CHILE, COLOMBIA, JAPAN, KOREA, MACAU, PARAGUAY, PERU, THE PHILIPPINES, PUERTO RICO, SINGAPORE, TAIWAN, THAILAND and the USA. Each new global edition has been founded on the same successful recipe that has been perfected over eighteen years in Miami, combining the most diverse electronic talent with the most technologically advanced, large-scale festival productions in the world. The ULTRA brands have pioneered the live stream experience with ‘ULTRA LIVE’ (bringing the festival online to over 20 million unique viewers globally) and the audio broadcasting platform ‘UMF RADIO’ (syndicated to FM Radio in over 62 countries and reaching more than 22 million listeners weekly). Also UMF FILMS’ collaboration with FINAL KID has seen some of the most visually breathtaking festival aftermovies in the music space, including a feature-length documentary exploring the explosion of dance music, entitled CAN U FEEL IT™, which was premiered on the red carpet at the Klipsch Amphitheater in Miami in 2012 and was exhibited in over 500 theaters across the Unites States. 2016 will see the ULTRA and ULTRA WORLDWIDE™ brands continue to push the boundaries even further, bringing an unparalleled combination of cutting edge productions and the world’s best electronic acts back to previous strongholds and new frontiers across the globe. With a brand new edition of ULTRA Brasil® confirmed to take place in Rio de Janeiro on October 14-15, 2016, ULTRA Singapore™ becoming a full scale two-day festival on September 10-11 and with ROAD TO ULTRA® entering Hong Kong later this year, the ULTRA brand has now united TWENTY COUNTRIES across FIVE CONTINENTS worldwide.